From the FACSI Facebook page. The banner hanging outside Lake Cemetery advertised the Exit Exterminating Company and featured various pests. 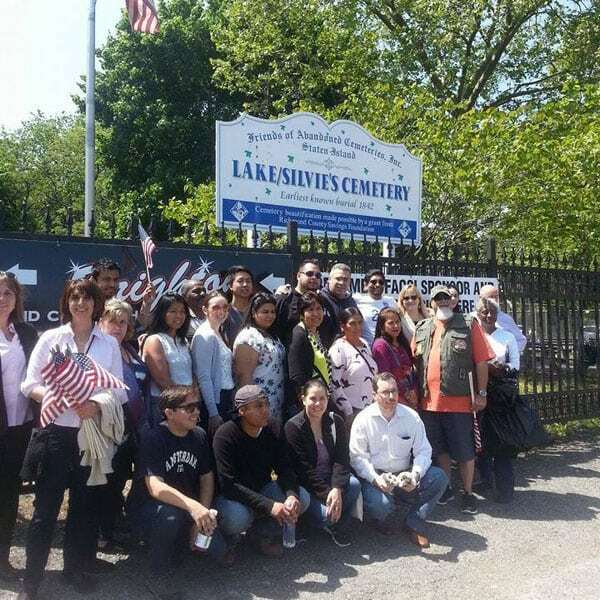 It was part of a fundraising effort to repair the fence around the cemetery, launched by Friends of Abandoned Cemeteries of Staten Island, which maintains 11 cemeteries across the New York City borough. What Friends did not realize is that outdoor banners like these are prohibited in this residential neighborhood—and the display’s questionable taste probably led to that violation getting reported post haste. The small nonprofit was fined a whopping $20,000—and that’s after an appeal to a hearings officer to knock the price down from an initial levy of $50,000 it certainly couldn’t afford. Friends of Abandoned Cemeteries had $1,740 in assets at the end of 2016. Lynn Rogers, who is the executive director of the group—a position that appears to pay exactly nothing—says that they had no idea the banner was illegal and that they had adopted the idea from a Little League field. She said they took the signs down right away when they heard that it was a violation. The cemetery has a couple of other violations on which it has not paid fines—a $49.47 charge from 1964 and $6,580.27 from 1970 when the city repaired its cracked sidewalks—but that debt with interest now amounts to $144,017.